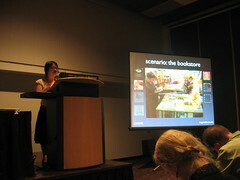 here i am, presenting at my first conference! sure, i’ve worked the mic on a runway and can chatter with friends until dawn, but that doesnt mean i wasnt shaking in my boots (on quivering tiptoes, since the microphone was just a smidgen out of reach) addressing a good part of the CHI community that was interested in everyday use of mobiles. thanks to francis who put up with my nervous performance-anxiety quibbles and who took some documentation of the talk. because, honestly, i have no recollection of the entire experience. blur, baby, blur. >I am not a great public speaker as well. I get soo nervous that I feel like I’m having an out of body experience and that I’m going to black out. Yuck! It gives me the heebie jeebies just thinking about it!